Contra Corner » Single Family Housing Remains Dead In The Water While Apartments Soar: Is This A Warning Sign From The Past? Single Family Housing Remains Dead In The Water While Apartments Soar: Is This A Warning Sign From The Past? 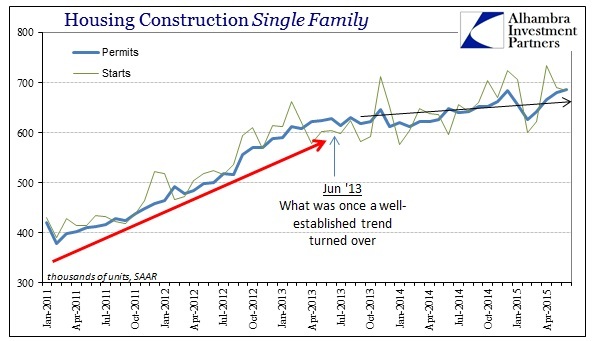 The single family housing market, at least from the view of new construction, continues on as it has for the past two years. There isn’t really much taking place, as new construction plods along in a curious stasis, sort of continuing to scrape along the bottom of the barrel. Permits and starts were again near 700k, SAAR, but that remains about 400k shy of what would be considered historically average or normal. Multi-family, apartment projects, however, have suddenly attained orbit. 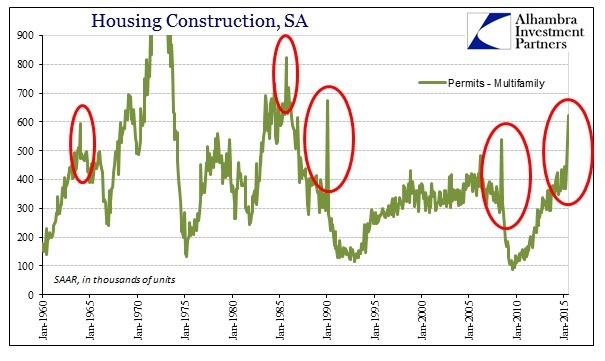 After slowing noticeably since 2013, supposedly filed permits to begin apartment construction in the past two months have surpassed not just expectations but even unreasonable expectations. 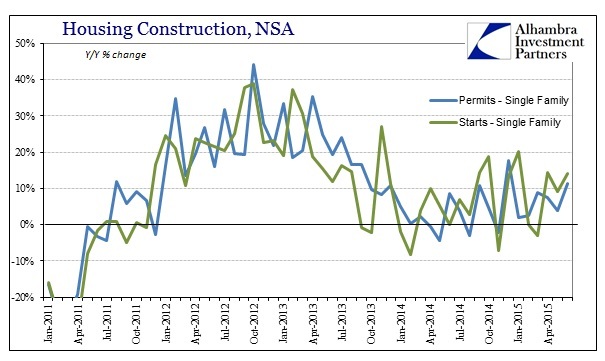 In April, year-over-year permits were just +2.4% and the 6-month average had tumbled to only +3.9%, a low not seen since the dark days of mid-2010 (compared to 50+% that was regular during the 2011-12 mini-bubble). Without any warning or reason to expect it, multi-family permits exploded to +47.1% in May and then +108.1% in June. 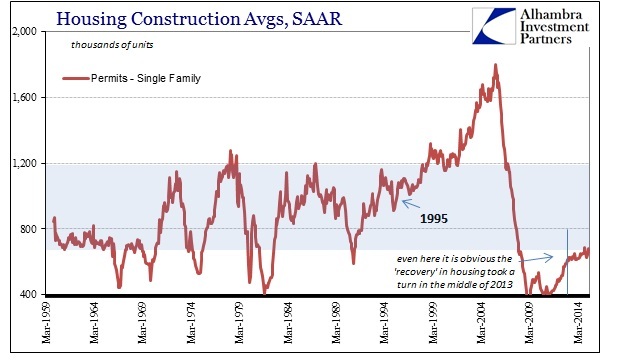 On a seasonally-adjusted basis, multi-family permits went from 370k in March to 535k in May and then 621k in June; the highest SAAR since January 1990. The problem, as I see it, isn’t actually statistical this time, though that has to still be considered a possible factor. 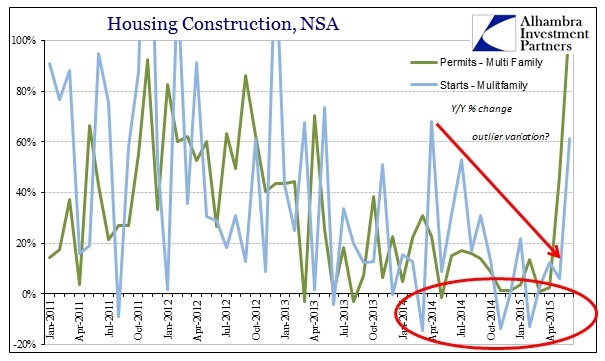 Instead, this kind of surge in apartment construction actually isn’t historically unique. The data shows exactly the same kind of unusual surge just prior to several key housing busts or significant downturns. If that is a repeat of the prior versions, then it is likely tied to financing – or really the expected dearth of it in the near future. The only reason to file so much permit activity all at once is ahead of any shutdown to leverage availability. That was certainly the case in the previous two periods, January 1990 as S&L and real estate problems developed into a full recession then; and then the spike in June 2008 as the GSE’s sharply devolved, along with so much else, toward bankruptcy (ultimately conservatorship). I have no real idea whether this is the actual same repeat as there isn’t much information available on apartment construction details and especially an aggregated financial situation. I can only point out the similarities of the statistics and infer, from the eurodollar “dollar” of late, a potential repeat. The rest of the real estate construction “market” is, again, unlike this to such a degree that it suggests just this kind of incongruity.